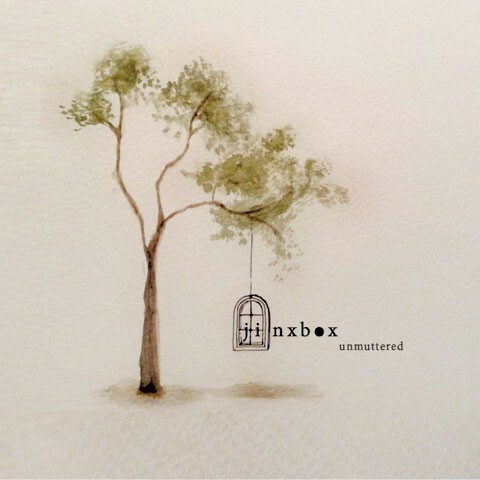 Unmuttered, the debut from Middlebury's Jinxbox, captures a spirited, out-of-the-box quality. The indie trio's first record displays subtle lyricism, deftly arranged synthesizers and piano, and an inventive vocal experiment in the use of octaves that suggests a great deal of musical curiosity. The album is a culmination of work over the past year and finds the band drawing inspiration from all aspects of life. Micah Rubin (drums, piano, synthesizer and synth bass), lead vocalist and ukulele player Zara London-Southern, and keyboardist Alex Kite share songwriting duties. Loneliness and alienation are key themes throughout, as is family. On "New World" and "Grey Eyes," Rubin borrows lines from his dad's poetry. The band says film scores inspired other tracks, including "Effect." Jinxbox produce and mix their own samples, embedding them in a shifting array of synth sounds. London-Southern's voice is tripled in octaves, adding to the band's ethereal aesthetic. On "New World," jarring synthesizers echo in an otherworldly way, evoking outer space. London-Southern's vocals collide like a meteor — or three — with the celestial instrumental backdrop. However, sometimes Unmuttered is simply too muddled. On opener "Hidden," lyrics are hard to discern amid the clutter of synth and organic sounds. But when Jinxbox find the right balance, the results are impressive. Synthesizers are prominent throughout "William Henry." The tempo and beat recall Eiffel 65's hit "Europop," in which synthesizers take on a life of their own. On "Grey Eyes," London-Southern's pretty vocals are strong and steady. Here, guest instrumentalist Emily Sunderman's violin surges above rippling piano. It's haunting and beautiful. "Me Time" is a cheeky ode to favorite things. "I love my movies and I love my cat / And I love my pineapple smoothies that I make when I feel fat," sings London-Southern over charming uke strums. The slowest song of the bunch, "Weight in Gold," is also one of the most powerful with its simple, repetitive refrain, "You're in control." Ghostly, high-pitched vocals, heavy bass and a cascading piano color "Homegrown." The song builds to a punchy chorus that's punctuated by in-your-face lyrics: "Stubborn devotion to blind emotion, vision is clouded, passion is clear." London-Southern gives us a commanding performance on the simple, slow ballad "Bloom." Unmuttered is ambitious in its sonic variety and experimental nature. Though not always on the mark, it shows great promise for a young band with room to grow and explore. Jinxbox's Unmuttered is available on soundcloud.com/jinxbox.